3. Many forms of grease trap are on the market. They consist of a trap large enough to collect the fat from the greasy water, which is carried off by the sink wastes, and the inlet and outlet are under the water level. The wastes discharge under an open grid, and the bucket which rests on the bottom can be raised when required to remove the grease floating on the top, and any solid substances which have fallen into it. As the result of a visit to Berlin by Dr. Gilbert Fowler of Manchester, a new form of grease trap is to be tried at Davyhulme. This trap is called the Kremer, and is made by David Grove of Berlin. Being recommended by so high an authority, it will be interesting to ascertain the results of the experiment. 4. A good example of the flushing rim gulley is Winser's (Fig. 191). A flush tank containing about 30 gallons, discharging at fixed periods, breaks up the grease and drives it through the drain. The great objection to grease gulleys is that they become cesspools if not frequently cleaned out. As regards flushing - rim gulleys, their expense precludes their general use in any but the largest houses. For general cases, the open channel is probably the best. In the country rain water is considered an advantage for washing, and care is taken to collect it (see Plate V.). Should it, however, be decided to run it into the drains, other arrangements must be adopted. 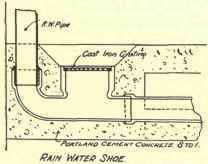 In any case, the rain-water system should be kept separate from the soil drains. Under these conditions R.W. gulleys are not needed, but the down pipes are connected to R.W. shoes fitted with movable galvanised cast-iron cover or grating (see Fig. 192). If the R.W. drains are connected to the soil drains, gulleys are necessary, a good type of which is shown on Fig. 192. After the whole of the drains have been collected they are disconnected from the soil drains by a disconnecting chamber (see Fig. 193). This chamber should have a ventilating cover, to ensure a good current of air through the drains, the down pipes acting as outlet ventilators. Provided that no foul water is connected to them, surface drains can be connected to the R.W. system; but otherwise, they should be joined to the soil drains. If the drains are laid at so low a level that the sewage can back up from the main sewer into the house drains, a ball trap of Couzens' or other make should be used. This consists of a copper ball floating in the trap, which, in the event of back flow, closes the opening on the house side of the drain. Owing to various local circumstances, it is sometimes found that drains must be laid to gradients that are not self-cleansing. In such cases it is advisable to fix a flush tank at the head of the drains. 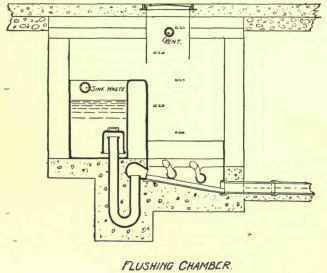 This may consist of a galvanised wrought-iron tank, or a brick chamber, in the bottom of which is fixed an Adams' or other flushing syphon (see Fig. 194). In this diagram a brick tank is shown, to which the bath or lavatory wastes are connected, or a 3/4-inch pipe taken from the nearest water main, with a screw-down tap fixed on the end to regulate the discharge. In order that the drains should act efficiently, and to avoid the accumulation of foul gases, it is necessary that they be continuously ventilated. This is effected by the difference in the density of the air between the inlet and the outlet ventilators. The system usually adopted is to have a short freshair inlet pipe at the lower extremity, and a tall outlet pipe at the head of the drain, and from the soil pipes. These outlets should be carried to a height well above all windows. Each outlet pipe may be finished with an open end, or with a galvanised wire cage to exclude birds. The total area of the openings in the cage should be not less than the area of the outlet to the vent pipe. All outlet pipes which are not soil pipes should be at least 4 inches diameter. The fresh-air inlet pipe is usually carried up from 4 to 6 feet above the ground, and connected to the disconnecting chamber; it should be fixed as far as possible from all door and window openings. It is generally fitted with a mica flap valve, which allows the air to enter but is closed by any back current. This inlet pipe should have a sectional area equal to the total areas of the various outlets, but in practice it is usually 4 or 6 inches in diameter. Probably the best material for inlet pipes is glazed stoneware, because there is no rusting as in iron pipes, nor likelihood of damage as in lead pipes. In any case a lead inlet pipe should be cased. 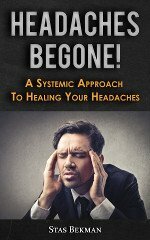 Beyond the necessity of keeping the pipes clear of foul air, there is the question of siphonage (i.e. emptying the trap of its water). If a trap is discharged full bore a vacuum occurs. 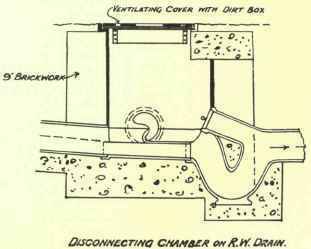 The pressure of the air at the intake of the trap, being then greater than at the outgo, causes either a part or the whole of the water to be forced out of the trap, and so renders it useless to stop the inflow of foul air. In the same way, if two w.c.'s are placed one above the other, and connected to the same pipe and the upper one is discharged, the flow of water will syphon the lower one. In both these cases this may be prevented by connecting a pipe, called the antisiphonage pipe, to the top of the trap. This pipe in the case of w.c.'s should be carried above the upper w.c, and connected to the soil pipe. While in the case of sinks and lavatories on the ground floor, or where there is no soil pipe handy, the antisiphonage pipe is taken through the external wall and has a brass grating soldered in the end, and is then called a puff pipe. Care should be taken to see that the trap is kept clean, otherwise water will find its way through the puff pipe and run down the wall.